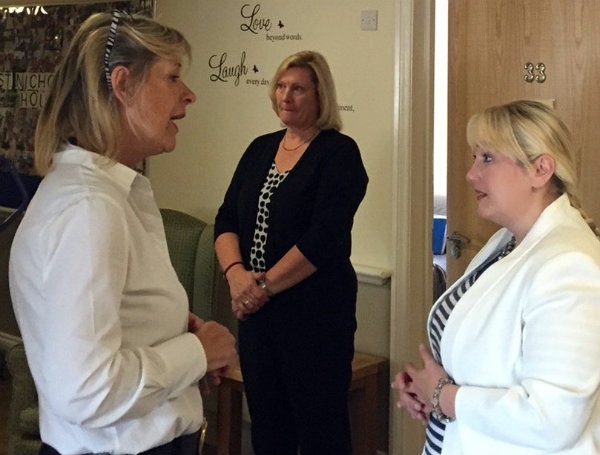 The new minister for social services and public health, Rebecca Evans, chose CFW member St Nicholas House in Churchstoke, Powys, for her first visit to a care home since taking up her new role. Ms Evans was greeted by owner Sheila Hill for the visit on July 14 (the minister is pictured right with Sheila, left and manager Helen Whithouse, centre). Sheila Hill said: “We had a call from our CSSIW inspector not long after our annual inspection saying the minister would like to visit. "It followed our recent good inspection report so I felt quite honoured, especially as this was her first visit to a care home in Wales. "I wasn't quite sure what to expect but she was very nice and asked me if I had any concerns or issues. I was able to raise the concerns we have about our EU workers following the Brexit vote – both they and we are worried about whether they can stay. They're vital to us and we couldn't run the home without them. "I also raised my concerns about funding for nursing beds," she added.